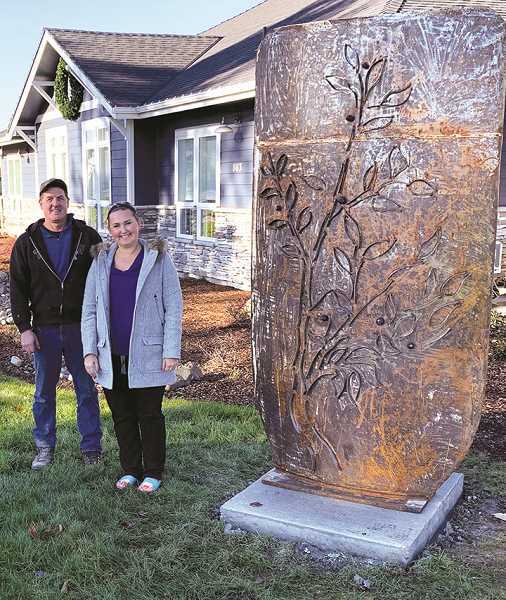 The City of Molalla continues to honor its past through artwork. It started the program back in 2015 when a Ford Family Foundation cohort and the Confederated Tribes of Grand Ronde helped create a light pole banner honoring the community and history. The banner's imagery can be used along with interpretive signage to expand the stories of Molalla's heritage and especially the Molalla tribe, which still exists. There are Molalla Indians among the Confederated Tribes of the Grand Ronde Community of Oregon that became "a nation of good hunters." They continue to use their hunting skills, which stems from a story told through the years about the Coyote and the Bear. The Molala (sic) Indians became great hunters following the oral story of the Coyote and the Bear. It seems the bear wanted to fight, but the coyote outsmarted him by suggesting they eat hot rocks instead. While the bear actually ate the hot rocks, the coyote only ate small strawberries. The bear died from the very hot rocks and the coyote skinned and removed his organs and threw his heart into an area stating that the "Molala will be good hunters; they will be good men, thinking and studying about hunting deer," according to the Internet. In 2018, a couple of council members, Elizabeth Klein and Leota Childress, applied for and received a $15,000 grant from Clackamas County's Mt. Hood Territory tourism program. The Heritage Art Walk is the product of that grant. Once the city received the grant, they asked artists to apply and meet with the city's design team. Sculptor Ben Dye was chosen for the project. Working with the city's design team and the Confederated Tribes of Grand Ronde, they chose to use the story of the Coyote and the Bear plus several other Native American themes. "The city of Molalla works very closely with the Confederated Tribes of Grand Ronde to ensure that the Molalla Heritage is being appropriately relayed to the public. We have been very fortunate to have them guide us through this process," said Dan Huff, city manager. "Everything we did was okayed by the Confederation of the Grand Ronde. We wanted to be sure everything was totally accurate," said Dye. Three of these art pieces are installed. One is a slab picturing huckleberries that the Molalla cultivated and dried for use in the winter. They used the entire plant, the berries for food and the roots for medicine. It is installed in front of The Dentist on Main on Highway 211 or Main Street. The huge Camas plant is installed at the Bear Creek Byway footbridge and represents food for the tribe. The roots were gathered, dried, cooked and eaten. The life-size Salmon sits atop a river is at Fox Park. The river was the Molala's connection for trade and travel as well as a food source. The Molalla traveled the river in flat-bottomed boats. These sculptures reflect the spring and summer banners placed downtown. The Molalla River School District, the city and the Ford Family Cohort continue to support the project with several more sculptures, including the Coyote and Bear, to be placed northwest of Grange Avenue; the Canoe west of Molalla Avenue on Main Street, and the Basket at the corner of Shirley Street and Cole Avenue. Dye said he's totally enjoying the work. "I enjoy doing public art more than private commissions," he told the Pioneer. "It takes the stress out of working. I'm having fun. I like to focus on local issues and encourage educators to connect the pieces to the community.